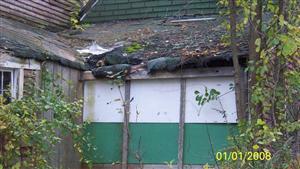 Last fall the club took on the ambitious project of replacing a roof for Freeport resident. Photos of the event are located here. In the fall 0f 2011, club member Jimmy Hendricks was approached by Representative David Webster and Johanna Hanselman from the Town of Freeport General Assistance about a long time Freeport resident whom was having trouble with a falling down roof. Johanna knew that the Freeport Rotary has a record of community service in Freeport and that we had undertaken “hands on” projects in the past. They went on to explain that this gentlemen had a long history of helping others; including repairing bikes for children and collecting and repair furniture for battered women’s shelter. David knew that he would not be one to ask for help himself but was in desperate need with his shed roof caving in around the access point to his basement; where his oil tank, sump pump and breaker box are all located. David was worried that that the roof would not make it through another winter and that there was a good chance the owner could be injured from the falling roof as well as no longer have access to his basement. After a short discussion with the Freeport Rotary Board, as consensus was reached that the club would donated funds and physical labor to ensure the roof was fixed. Before the project could get started the site area around the building need to be cleaned out. That project was undertaken by Chad Coffin and other members of the Maine Clammers Association. Once that work was completed, David, Jimmy and another club member Ken Toner devised a plan of action and the project took place on November 4-6th. Many club members got involved to help out and the project went as smooth as an old rotting roof could get. Friday the 4th, a crew of 8 spent the afternoon ripping off the old shingles, cutting back rotten rafters and re-supporting the roof. Saturday was spent with more of the same and day ended with the roof more than half way shingled. A small crew returned Sunday morning to finish the job. A special thanks goes to Ken Toner for donating all the lumber for job, Johanna Hanselman for donuts, cookies and coffee, Michelle Allott, Elaine Small and the home owner for donating lunch and The Fresh Batch for donating desserts to keep us going.